This opera length, 35, crocheted necklace, entwines fine silver wire, turquoise, faceted fan-shaped amethyst, iridescent purple and turquoise seed beads, and round faceted milky blue glass beads. 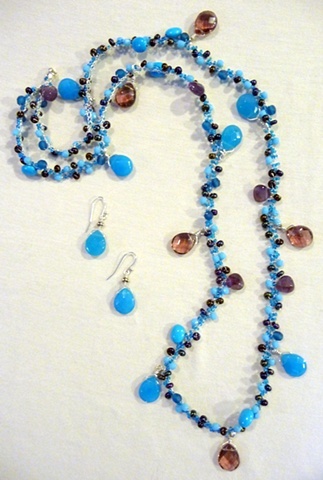 Faceted glass drops of purple and turquoise dangle at various lengths along this elegant necklace. It is finished with a sterling silver lobster clasp and split ring. These sterling silver earrings feature faceted drop earrings in ocean blue turquoise glass. They hang at a length of 1.75 from sterling silver French ear wires, with a Bali silver accent bead. These pieces were custom made for my grandmother, Barbarann Barkis.